Located inside the Red Rock Canyon National Conservation Area, Spring Mountain Ranch State Park is a 520-acre oasis beneath the multi-colored cliffs of the Wilson Mountains. An alternate route of the Old Spanish Trail came through this valley to take advantage of the grassy meadows fed by springs sourced in the Wilsons. In the 1840's, a group of Ute Indians and American mountain men used the valley as a base from which they raided Mexican ranchos in California. Old Bill Williams, a famous mountain man, was a member of that raiding party and he returned to the area several times over the years. Wagon trains and pack trains travelled through here until the railroad finally came into the valley in 1905. Horse thieves, Indian slavers and other outlaws also used this remote trail regularly, until the arrival of the train. In 1876, Spring Mountain Ranch was homesteaded as the Sandstone Ranch by Jim Wilson, a former Army sergeant from Fort Mohave. In 1929, Willard George, a friend of the Wilson family bought the ranch but kept Jim Jr. and his brother Tweed on to run the cattle operation. Eventually, George gave the Wilson brothers a life estate to the old cabins that lasted until Tweed finally died in 1959. In 1944, George leased (with option to buy) to Chet Lauck, an old radio show comedian. Lauck exercised his option to buy in 1948 and renamed the property the Bar Nothing Ranch. He kept the cattle operation going but built part of the ranch into a family vacation retreat with a much expanded ranch house, a boy's camp and a large reservoir that he named "Lake Harriet," after his wife. He sold the property in 1955 to Vera Krupp, a famous German movie actress. She renamed the property the Spring Mountain Ranch, built a swimming pool and expanded the main ranch house even more. This was her principal residence until 1967. Some time after that, Howard Hughes owned the place for a while. 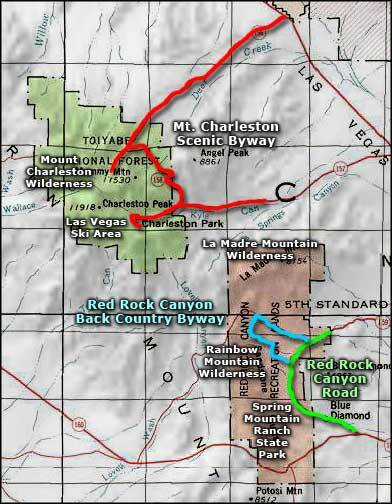 Spring Mountain Ranch State Park is off of Charleston Boulevard, about 15 miles west of downtown Las Vegas. The ranch is at 3,800 feet in elevation, which means occasional snow and winter nights below freezing. Summers are hot with a few thunderstorms that often bring flash floods. 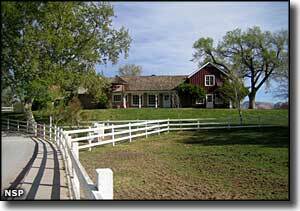 The main ranch house is open to the public usually 7 days a week from 10:00 AM to 4:00 PM. The picnic area is usually open from 8:00 AM to dusk. There is no camping available. Entry fees: $9 per vehicle per day for non-Nevada residents, $7 per vehicle per day for Nevada residents. Photo of Spring Mountain Ranch State Park entrance courtesy of Pburka, CCA ShareAlike 3.0 License. Photo of Spring Mountain Reservoir courtesy of Wikipedia userid ZooFari, CCA ShareAlike 3.0 License.